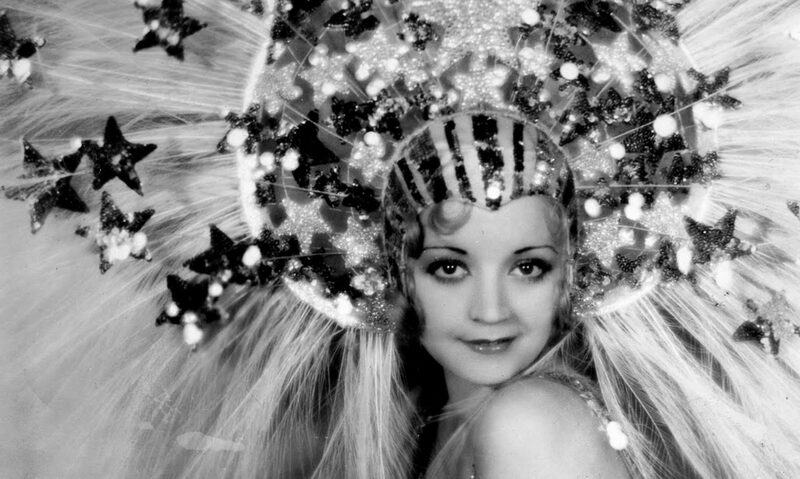 As you can figure, this a pre-Code that involves one of those ‘breach of promise’ suits that were popular meal tickets for showgirls of the era. The journalists hang out in a speakeasy, the rich have their own horde of alcohol. 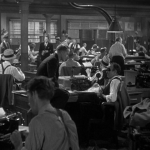 I always figured there were two kinds of journalists back when I was keeping track of such matters: the ones who got into the business after watching His Girl Friday, and the ones who got into it after watching “The Today Show”. That was my general opinion back in college since I spent my first two years studying to enter the school’s journalism program. Lecture halls were filled with kids debating ethics, the care needed in proper news reporting, and, mostly, just how good we were supposed to look on camera. In those pre-blogosphere days, you were either there for the fame or for the passion. Well, passion was never one of my fortes, so journalism and I parted ways. 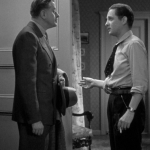 But I remain fascinated by the profession, and it turns out that the early 30s are a bonanza for films about journalists, both the schmucks and the noble heroes of the fourth estate. 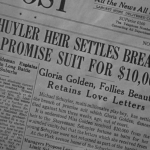 Of course, pre-His Girl Friday the portrayals of journalism were less about talking fast than about the nefarious doings that newspaper either inflicted or uncovered. Take Picture Snatcher or Five Star Final, two films that showcase the seedy depths papers sink to for an exclusive, no matter how grisly. Platinum Blonde (you knew I’d get to it eventually) is the romantic comedy tangent of this, the tale of a newspaperman whose lackadaisical and straightforward style runs contrary to the wealthy people they report on. 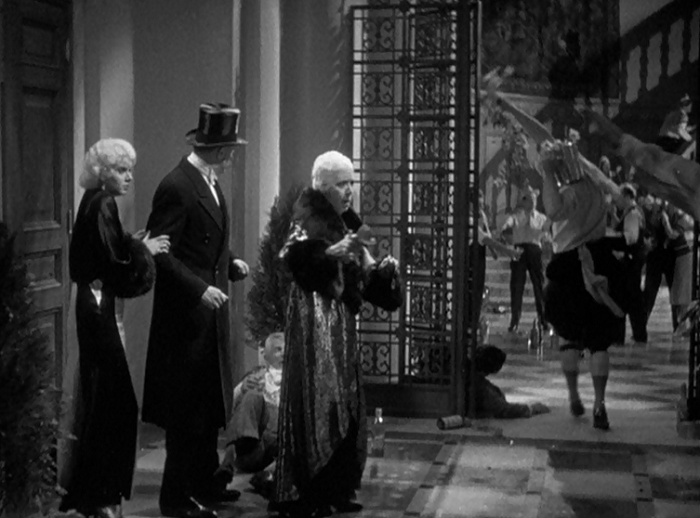 While it’s easy to read the film as a ‘rich versus poor’ screed, especially once you know Frank Capra was behind the camera on it, Platinum Blonde offers something far more outrageous. Well, maybe not in the romance department. Stew Smith is an easygoing but dedicated reporter for the Post. Actor Robert Williams is kind of a mix between Bing Crosby and the titular Fletch where his presence floats free from the confines of the picture’s particulars, a force of no one’s nature but his own. He’s likeable, and functions by his own set of rules. One of those rebels whose only cause is to avoid wearing sock garters. He’s against taking bribes, but is willing to cajole a bit to get to the heart of an news story. Or maybe the heart to the left. That heart happens to belong to heiress Anne Schuyler. Her family is embroiled in a scandal after her brother breaks an engagement to a showgirl, and Stew inserts himself into the middle of it. Though he publishes a muckraking story against the family’s wishes, he wins over Anne when he manages to snag himself some blackmail material the showgirl was holding and returning it free of charge. This isn’t free of complications, however. There’s another girl at the newsroom office, Gallagher, who has had her eyes set on Stew for a while. Her problem is that as a professional woman, no one regards her as a woman. Even though she’s played by Loretta Young! This little love triangle comes to a head after Stew and Anne elope. It’s quickly revealed that both have made plans to change one another– he thinks they’ll move into an apartment in the city while he works, she thinks he’ll become a society man. 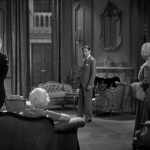 Since Anne is played by Jean Harlow and each of her offers merely invite him to become more comfortable, his defenses fall quickly. 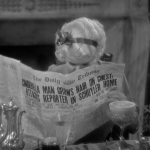 Though his newspaper buddies chortle at his expensive new garters and call him ‘a bird in a gilded cage’, it’s not until he sees Gallagher in a dress that his head turns back around. Oh, that and the fact that he can’t keep his name out of the rival paper’s headlines. The Tribune, represented by an unscrupulous fellow named Binji, pops up at several points to give Stew a very public razzing. The night that Stew finally notices that Gallagher is a she and the night Anne discovers that Gallagher is a she is also the same night that Stew gives Binji a swift sock on the chin. The next day’s Tribune front page headline calling Stew a macho he-man who won’t be kowtowed by wealth drives the wedge between Anne and him deeper than ever before. This may seem like typical romcom plotting, but here’s the funny thing about the romantic leads in Platinum Blonde: the rich Anne is the more appealing of the two. 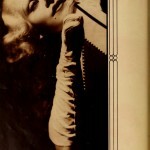 Anne is played by Jean Harlow (for whose famous locks the movie was named) and has such a relaxed spirit that it’s difficult to root against her, especially since most of her actions come from the heart. One scene in particular, where Stew and Anne duet to the tune of “Farmer in the Dell”, is especially endearing. 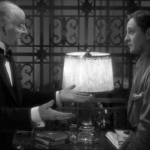 Compared to Gallagher, whose entire character arc is merely sitting around and waiting for Stew to come to his senses, makes it difficult to reason out why the two end up together in the end. But it’s still a pleasant journey. The class clash comes on strong with Stew butting heads with Anne’s mother and her lawyer, who also has his eyes on the pretty young girl. This results in a number of great scenes as their less-than-delicate attempts at cordiality explode on the runway. The inmates have broken into the palace. 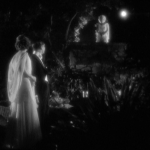 But the best moments in the film come between Stew and the butler Smythe, the only other inhabitant of the mansion on a night when Stew throws a fit. 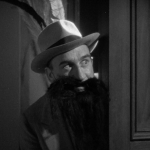 Smythe explains his philosophy of living– “Smythe to Smith”– and demonstrates the hilarious concept of how he passes time by ‘puttering’. 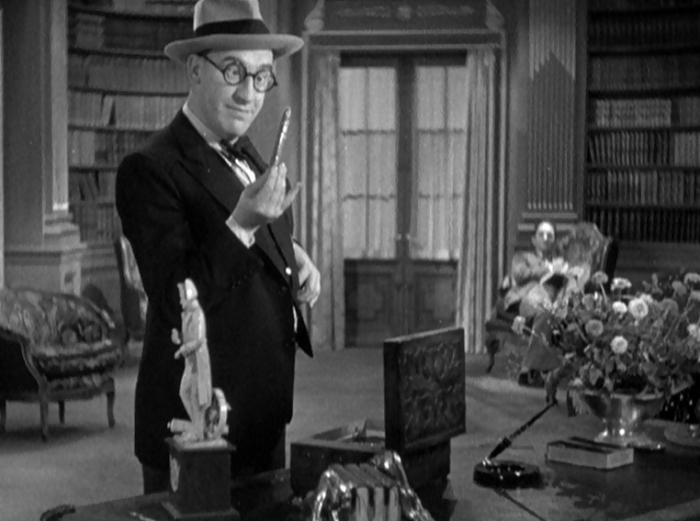 But it’s Smythe who reawakens Stew’s libidinous desire for the passion for writing. Stew brings over all of his reporter buddies along with Gallagher and soon the whole mansion is a madhouse. 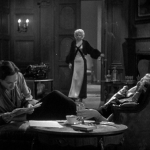 The funny thing about Platinum Blonde isn’t that the picture is a triumph of good over evil or even the spirit of the poor and hardworking over the rich, though it certainly tries to paint itself as a testament against the dangers of emasculation. But the truth is that Platinum Blonde is really the story of the triumph of the Tribune over the Post. Though Binji is a conniving opportunist, his public campaign against Stew manages to break apart Stew’s marriage and send him packing to becoming a playwright, where he may be remotely successful… but he’s no longer the star reporter at the Post. 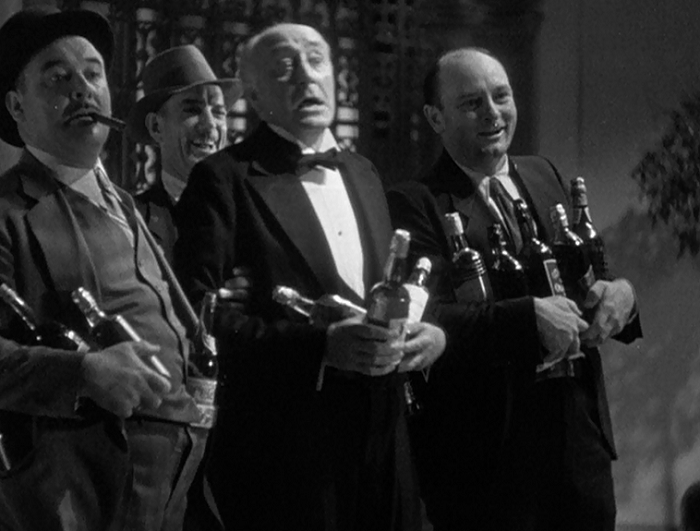 The journalists in this movie are the frat boys of the 30s, reckless and carefree. They drink hard and work hard, and can be cruel at the drop of the hat. Stew even forgives Binji after he’s allowed to give the man a swift kick in the rear, as their brotherhood reaches beyond petty feuds and power grabs. And while it’s the romance and class clashes that provide the heart of the film, it’s the passionate anger of the journalists that drives it. 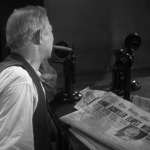 For while it may not be earth shattering, while it may not be honest, it’s news, and any newspaperman’ll be damned if they don’t get it out to you first. 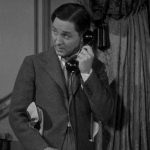 Star Robert Williams certainly has the kind of laid back charm that could have made him a huge star, but he died from appendicitis a few days after this film’s premiere. 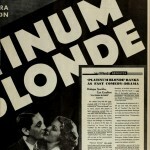 Two alternate titles for the film, before Platinum Blonde was deigned to take advantage of Harlow’s famous locks, were The Gilded Cage and Gallagher. Mordaunt Hall in the New York Times likes the movie well enough, and notes that, “When a newspaper man sits down to do a piece of fiction about his craft he is likely to produce a reporter like Stew Smith, the hero of “Platinum Blonde.”.” From a legitimate 1930s newspaperman, that’s a funny kind of compliment. I’m going to see if I can get the same article published on the front page of my local paper, only replacing Anne with Aubrey and see what my wife says about it. Odds are I will be smacked with many newspapers, but ‘Okey with Me’ would be a remote but nice surprise. The Lady Eve covers concisely what you’ll see in a number of these other pieces with a lot of details on the film’s making of. 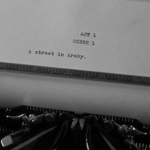 Mike Grost discusses the film’s themes and Capra’s camerawork. He also covers a number of other Capra films with a good, analytical eye for anyone interested in learning more about Capra’s methods. 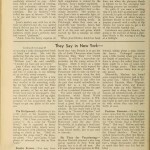 A surprising number of reviewers disliked the film simply because it made being one of the idle rich seem unattractive. Why I never! My plans for the evening as well. 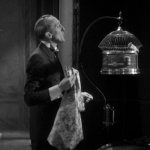 TCMDB talks about the film’s gestation and the leading ladies. Capra wasn’t too big on this one– his touch isn’t much apparent, and the film’s script was apparently complete before he joined the project. 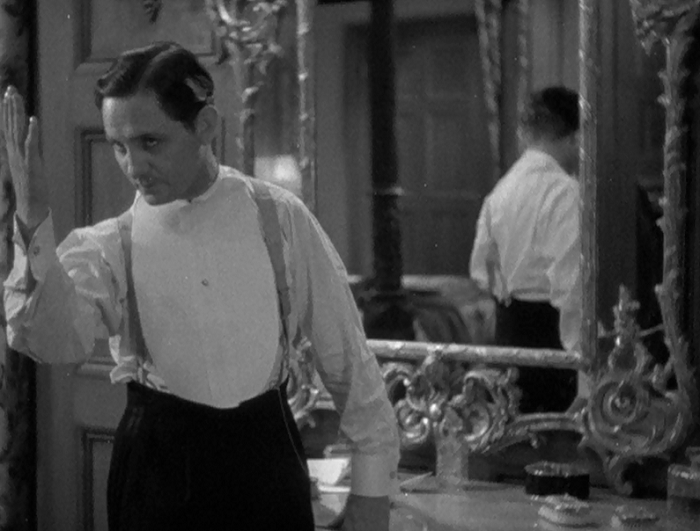 As you could probably figure, a Harlow craze was sweeping the nation, which forced this Young-centered film to be refocused. There were some bad feelings in the cast, though Capra seemed quite fond of Harlow all the same. 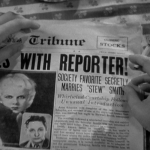 Laura’s Miscellaneous Movie Musings takes this one on and gives it a thorough appreciation, and points out that when this filmed, Jean Harlow was 20 and Loretta Young 18. At those same ages, I must confess, my most notable accomplishment was smelling substantially better than I’d used to. 11 East 14th Street tells their story of the woes of trying to learn about 1930s film stars in an era before the internet. Lots of good stills. 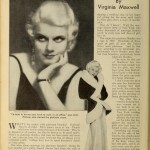 Did someone say they wanted to see more of Jean Harlow? 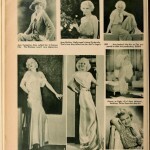 Just in case after all of this, you’re still craving more Jean Harlow, there’s a site called The Platinum Blog which covers more Harlow than most of her outfits did. Great article on a movie I’m inordinately fond of. I think Mr. Williams and Mr. Hobbes have a lot to do with that. I find Harlow a little hard to take in this picture – a little out of place as the society lady. So young and still learning her craft. She would learn quickly though. I disagree about Harlow. While she could play a ditzy manipulator to the nines, I think her sweetness comes through here. Her character is genuinely empathetic, even if she’s less malleable than Stew. I was definitely rooting for her over the bland Young. I agree with Patricia about Harlow being a little out of place, but I do love that “Farmer in the Dell” thing she does with Williams. 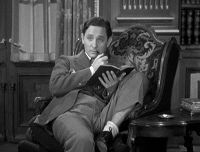 And Walter Catlett must have played a skeezy newsman in every movie he ever made. I had to mention that “Farmer in the Dell” scene because it’s adorable and raw, breaking you out of the picture however momentarily. It definitely makes Harlow’s character work better than she should. I remember the first time seeing Platinum Blonde, one of my favorite performances is Robert Williams in this. It’s true, he would of major star if he had lived. He could have easily out-Bing-ed Bing, I think. Too bad. Ha! I loved your observation that journalists were the “frat boys” of the 1930s. Very true! 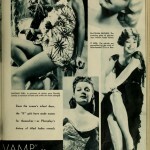 Really enjoyed your comprehensive review of this pre-code gem. Thanks! Those journalists know how to drink and party. The film needed a keg stand or two to drive this home. It’s a long time since I’ve seen this great Capra pre-Code, but I remember thinking that Robert Williams was excellent, and must agree with Shell above that he would have been a major star if he had lived. Sad to think that both he and Harlow died so young – they make a fine combination in this, though I was rooting for Loretta Young and loved the fact that this reporter won her man without having to change or give up her career. And she never even gets a first name! Huh, I figured Gallagher was her first name, though I suppose that’s weird in retrospect. I was also under the impression that Gallagher gave up her career at the end so she could become Stew’s housewife, but I don’t remember for sure. I was definitely rooting for Anne and Stew, but it looks like I’m in the minority on that one. Sorry, maybe I’m misremembering the ending – it’s a few years since I saw it – or maybe I just hoped she would carry on with her career! Sounds as if I need to see it again. I’ll chime in as one of the Robert Williams mourners here. I really liked the movie, thought “Where did this guy come from and how come I’ve never heard of him before?” and went to IMDB expecting to see 30 or 40 years’ worth of successful character actor work, only to find out that this wonderful performance was his last, and one of only a small handful that exist in the first place. What a tragedy. I did exactly the same! It was in a way like watching a film from another dimension, with a really famous and succesful actor we’ve never heard of. It’s been a long time since I’ve seen this, but this film was the one that got me interested in classic movies. 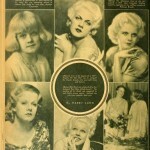 I was obsessed with Jean Harlow for ages after. I wonder how I would feel about it now – I see from the comments there’s mixed reviews about her performance, so I think it’s worth a re-watch. Thanks for sharing! Harlow was definitely more infamous than a great actress starting out, and there’s always some debate as to when she finally got her stuff together. Compared to her MGM work, this is naturally a bit more rough, but I think it’s still well done. I think most are just put off by the fact that Harlow’s character is much sweeter than the roles she’d become famous for later on, which is quite a big turn around. I fell in love with this movie and had to add it to my collection. I wish we had gotten the opportunity to see Robert Williams make other films. I thought he did great. 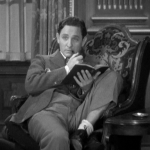 In an intro on TCM I heard him compared to Spencer Tracy. I can see the similarities, though I’d definitely take on Williams in a fistfight before Tracy! Oh, yum yum! What a great review! Yes, it’s hard to believe that Loretta Young could be overlooked in any situation. Aside from her striking looks, Harlow still had a way to go before she perfected her persona,,but Young and Williams are tops. I guess the movie’s biggest reach is getting someone to think of Young as ‘just one of the guys’. She never looked like any guy I ever saw!